The Trouble With Common Sense Is That It Isn’t All That Common. The article I wrote last week about Human Resources management, and the fact that some managers cannot even manage, rolled out an interesting sequel in real life this week. You see, what happened was that the “manager” in question that inspired last week’s article this week decided to draw his line in the sand, so to speak, and dig his heels in. Manager by name and title only. You see, what happened was that the “manager” had chosen to manage a situation in the workplace by sending dictatorial emails. As a result of this emails only approach, and the content of those emails, the person being managed then requested for communications with the “manager” to be conducted via telephone. Despite this request the “manager” continued his communications only via emails, and those emails continued to be of a dictatorial content and nature. The end result was that the person receiving these very one-sided emails had no choice then than to by-pass the “manager” and request audience with higher authorities within the organisation. It seemed ridiculous that because the “manager” was ignoring organizational structure and processes that this situation even arose in the first place. Sadly, the actions of the “manager” are tolerated by his superiors within the organisation because he has knowledge that the organisation needs on other technical matters not related to HR. My feeling on this is simple. I’ve seen time and time again where businesses and organisations have hung onto and retained the wrong type of people in roles where they are professionally inept and unsuited simply because there was nobody else in the organisation with the knowledge to perform the mechanical tasks that those people could do. Do you hear these excuses in your business? The amount of damage caused to businesses by retaining those employees who exhibit the behaviours of “onboard terrorists” and protect their turf by making out that they are indispensible while at the same time harassing staff and sometimes even customers with their anti-social behaviours and abysmal people skills, is far greater than the short term inconvenience and disruption of trying to replace those nasty people. I’ve seen businesses hang on to the wrong people for periods of time that drag on into years and sometimes into decades. Only last month I was approached by a financial advisor whose dentist client employed a dragon [his words not mine] who was choking the progress of that dental practice. I don’t understand why poor employee behaviour is tolerated by those in charge in the workplace? If somebody refuses to do what they need to be doing and exhibits behaviours that are not in the best interests of the firm, and is unable to improve those anti-social behaviours while receiving payment from their employer, then they need to be relieved of their position. There’s no place for a “yes but” approach when it comes to employing anti-social polarizing dictatorial narcissists. How desperate does an organisation need to be? Do You Know The Best Way To Recover From A Service Failure In Your Business? A friend of mine likes to fly up the pointy end of the plane. And yes, he knows that it is the most expensive real estate on the planet up there. He knows that when he flies up front that he is subsidising the cheaper fares of those who travel at the rear of the plane in the narrow seats, and he’s happy with the benevolence he displays so that those at the back do not have to pay more. And he is also aware that the front of the plane and the back of the plane reach their destination airport at about the same time, give or take a few seconds. And I say if he chooses to travel in that sorbet of luxury, well, good luck to him. Now you’d expect that as a platinum frequent flyer as well that my friend might receive some thanks for his loyalty? After all, the cabin crew would have his profile, wouldn’t they? On a recent interstate trip, my friend was carrying a suit in a suit bag. He was also wearing a blazer. On boarding the aircraft, my friend handed his suit bag to the flight attendant in his cabin, and also had his jacket taken and hung for him. On both the forward and returning journeys. On both occasions, my friend’s jacket was returned to him before descent, as is usual and customary. On the outbound flight, my friend was handed his suit bag as he disembarked from the plane. However, while waiting at the carousel for the rest of his luggage, my friend was approached by another traveler and was asked to “exchange” suit bags as the flight crew had given each of them the other’s suit bag. An honest mistake, you would say? But what would have happened had this exchange not taken place at the airport? The end result was a good one, but the engineering of that result by the airline left a significant question in my friend’s mind as to whether the process was maybe a little haphazard? On the return leg, my friend disembarked the plane and picked up his luggage from the carousel before he realised that the flight crew had not given him his suit bag. And so on this occasion, my friend had to go back inside the airport and inside through security to see if he could collect his suit. My friend ended up actually on board his previous plane as it was boarding for its next journey, trying to locate his suit bag… the head steward told my friend that they had given his suit bag to crew at the gate of the boarding lounge, and that if the suit bag was not with them then it would be downstairs at the baggage counter…my friend was getting very frustrated…. Searching for the missing suit bag while his wife and his luggage were already waiting out front with a taxi. Why on earth had the flight attendant not had the suit bag ready for my friend as he was disembarking? My friend believed, and rightly so, that for the price that he paid for his pointy end business class ticket that he had purchased not simply a better seat on the plane but he had purchased a better form of attention. My friend felt that his ticket price demanded a better form of experience. And he did not receive that experience. When my friend located his suit bag with the ground staff, they told him that they could have located him, if only he had had his name on the suit bag. And that it was my friend’s fault for not having a labeled suit bag. My friend explained to the ground staff that in his haste to de-plane, and to gather his own onboard luggage from above seats behind him, that he had forgotten to ask for the suit bag. My friend asked what he should have done, because the safety gear was housed above his seat, which meant that my friend had to be conscious of time when gathering his onboard luggage. My friend felt that the airline, Qantas, in these two instances, had failed him. For the price that my friend paid for a front of plane experience, he was not delivered a front of plane experience. At no time did anyone from Qantas offer an apology to my friend for either of the two slip-ups that they had allowed to happen. In the first instance, my friend saw nobody at all from the airline, just the fellow traveller. In the second instance, neither the stewardess at the gate, nor the steward on the plane, nor the ground staff had offered any form of apology to my friend for inconveniencing him. Now my friend understands that this is indeed a “first world problem”. And maybe he was being a little bit precious…. But, and it’s a big but, if Qantas is going to be offering a high ticket option then they need to make sure that they give a high ticket service and have in place a world class service recovery process. Both of these instances could well have ended up with my friend and his suit being separated permanently. And that outcome is unacceptable for a ticket price that is somewhere around five times the ticket price for a seat in the back of the plane. At no time did my friend ever feel that Qantas was doing this for the price that he paid them to travel in the more important seats. If customers don’t feel that they are valued, then they will go elsewhere with their business. The number one reason that customers leave a business is apathy, or perceived apathy from employees in that business towards those valued customers. Maybe my friend does need to travel lighter on his flights when it comes to carry-on baggage? But for the price that Qantas charge to sit in the front of their planes, they need to make the experience memorable, for the service and the service recovery, and not for the service failures. How are your systems in your business? Do you have a service recovery protocol that makes the process of recovering from all of your service defects even better than if the defects had never happened in the first place? Common Sense Advice on Human Resources Management. This week I’ve been reminded of the delicacy that exists in being a “manager” of people. As an employer, a dentist owner of a Dental Practice sometimes steps into the role of staff management or human resources management without any formal training. I feel the role of human resources manager [HR manager] is an honour that needs to be earned as opposed to simply being a title that someone can acquire. That being said the act of purchasing a Dental Office allows someone to acquire the title of HR manager even though that person may be devoid of the skills necessary to run and to “manage” a group of people. And that group as such could be as small as even just one. We know that in business sometimes there are decisions that need to be made that can have an impact upon employees that are less than favourable. Now, I’m not talking about difficulties that can arise during the day to day running of a business. In business there always needs to exist some form of command-and-do relationship, for that business to function and survive. Provided the tasks are reasonable, and legal, a system of this nature should work fine in any business. There does not need to be a “committee meeting” between employees to debate the merits of each and every decision and instruction involved in the day-to-day operations of the business. It is the role of the manager to therefore facilitate any decisions in such a way that the business runs in an harmonious manner. The end result, and therefore benefit of having such a system, is that employees have a place of employment where they feel that they are contributing and achieving for the betterment of the business, and for the betterment of the customers, and for the betterment of the employees. Whenever any employee feels that the relationships that exist within the business are skewed away from being “fair” then we do not have complete harmony. Of course there will always be a need for decisions need to be made within the business. It is the role of management to ensure that these decisions are equitable and fair. Sometimes it is necessary to make decisions that improve the functionality of the business that require the removal of employees from roles they have been performing. So long as these decisions are made in a manner that is logical and explainable, then these are simply events that become necessary for the survival of the business. Employees need to be aware of these potential situations. Employees need to be aware that employment in its own right is not a guarantee. It is purely an offer. So long as the offer is accepted and enacted upon with ability and achievement, then the business should function well. So long as decisions in the business are made that reflect recognition of the presence and existence of those abilities and achievements, then the business should grow. Decisions made that ignore achievement and ability and are illogical cannot be tolerated and should never be allowed to be made. Injustice has no place in a workplace. It rips away at the pure heart of the business. Perpetrators of injustice should be extricated from the business. These perpetrators are either ignorant of their actions and their subsequent consequences, or they are out and out bullies. Neither behaviour is acceptable. Neither behaviour should be tolerated. Sadly, in small business, these poor managerial behaviours are tolerated because of the small nature of the business in itself. Sometimes, in bigger corporate entities, bullies can survive among the machinations. Thank goodness these sorts of characters, and behaviours are rare. Sadly, they still arise from time to time. Achieving, and over achieving in the workplace, sadly, is no guarantee of employment. Managers with inadequacies see over-achievers as a threat. The pure act of an employee achieving can make the bully manager feel threatened and thus react and respond in their usual and illogical and intimidating way. We all know of managers who behave in this manner. Provided you are performing your employment roles admirably, you should be encouraged to keep doing so. Our duty is to ensure that the unfair behaviours of these managers are not allowed to continue. Always Offer Best Treatment. And Offer It First Up. My MacBook Pro started to die. Well, it’s been filling up and slowing down for a little while now. Not to mention the fact that it doesn’t talk well to Microsoft Outlook. On top of this, a couple of weeks ago, my MacBook did not respond too well to having its keyboard cleaned with Gatorade. Well, Lemon-Lime Gatorade to be exact. Well it wasn’t so much of a cleaning as an accidental bathing. So what happened was that after the Gatorade incident, the mouse curser on my MacBook began to float and have a mind of its own. Which made typing and using the Mac rather a challenge. I do have a remote keyboard and remote trackpad as well, but using those did not circumvent the floating curser problem. At the same time, I was also trying to free up some disc space by transferring and deleting old files…. But my efforts at this were proving to be far from successful. So I decided to do what any sane person would do. I decided it was time to buy a new replacement MacBook. Now you would think that this would be a simple process…. open up new MacBook, migrate information from old MacBook to New MacBook, and live happily ever after? Well, there was one small problem…. The new MacBook started telling me that it did not have sufficient storage to receive the migration from my five-year-old MacBook. So I phoned Mac support. It seems that the New MacBook I bought, although top of the line, did not have “additional storage” added into it. Which meant that it did indeed have less available storage than my five year old MacBook. The guy on the phone directed me to the Mac website, and explained to me that I could buy more storage, either an extra 1TB or 2TB, and because I had only owned my new Mac for just one week, I was in my rights to simply switch my new Mac over for a version with the larger storage. So I headed up to my local Apple store the next morning. When I arrived, just prior to opening, an Apple employee greeted me outside and I shared my story. “you are in luck, we have a replacement MacBook for you with 1TB in the store”. However, my way of thinking was that I was going to want a new MacBook with 2TB, to avoid running into another storage problem in the not too distant future. So when the store opened, I was directed to a supervisor, who explained to me that I’d need to return my new MacBook, and purchase another with the 2TB storage option. And that the new replacement MacBook was not in stock in the store, and may not arrive for another seven to ten days…. This kind of seemed to be becoming a very long way around type of adventure. So that’s what I ended up having to do. And I would have bought more storage then and there. When I suggested this preventive solution to the supervisor, she immediately corrected me and told me that the sales lady had sold me the model that they had with the most available storage…IN STORE. And she made me feel that I should have been so grateful that I was indeed sold the best MacBook…AVAILABLE. But the original sales lady had not solved my problem. All she had done was sold me her best available. She had not sold me THE BEST AVAILABLE. She had not solved my problem. Now I’m not sure if the Apple employees are paid on commissions? Is a sale today of anything, better to have than a sale tomorrow of what the customer really needs? Could she have located what I really needed at another store? Would she have lost a commission? Why did she not solve my problem? To her credit she did start with the best model. She just didn’t start with the add ons that make it better than best. So how does this relate to dental? Do you ever sell someone treatment that you can do rather than offer them best available treatment that they might have to receive elsewhere? Do you perform endodontics when you know that a specialist would probably do a better job? Do you sell what’s on your shelf to the patient rather than what they really need? Like dentures, instead of implants? And you may do this because what they really need will cost them more, and you’re not sure they are still going to like you if you recommend the higher priced treatment? The additional storage on the MacBook is not a low fee. But if I’m not offered it, and I don’t get told of its existence, then how can I ever choose it? 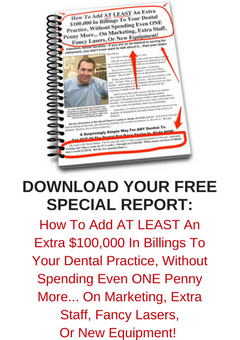 Will every patient in your dental practice choose best treatment? If you offer best treatment to everyone, it makes sense that more people will choose it than if you never offer it at all. In 2004 I took over a dental practice and none of the patients that I saw from that practice had any posterior crowns. All were restored with patch upon patch upon patch. Over the next five years, I helped most of those patients to keep their teeth by protecting all those heavily patched teeth with full coverage porcelain. I offered them best available. And most of them accepted that treatment gladly. Always, always, offer best treatment. Not what you think they can afford or what you think they will accept. You’ll be surprised at how many patients do indeed want best treatment. And yes, this may be true. But it is a cliché. If you say a cliché for long enough and often enough then people begin to take those words as gospel. We can’t have people accepting comments without due thought processes. When we hear the phrase, “You get what you pay for”, people often think that the more you pay the better something must be. What needs to be considered is the value for money proposition. We think that obviously spending more should mean an improvement in quality, and longevity. But when does perceived value start to flatten out as we see an increase in cost of an item or service? Sometimes paying more, much more, does not equate to a proportionate improvement in value. The price of cars is a good example here. Is the extra cost of a Lamborghini really worth it when we consider that all cars are only allowed to drive at a maximum legislated speed limit on our roads? And so the extra dollar cost for the Lamborghini would be difficult to justify in terms of journey time savings…. We do know that there will always be a percentage of the population who will seek to pay the least for certain products and services. Some people out there hate to feel that they have paid one penny more than they need to for something, despite the fact that the less expensive product is indeed inferior. These people inherently hate to pay one penny more than they need to, despite the fact any extra cost could easily equate into a significant saving of time or effort or both. You see most people out there simply do not want cheap. They want to avoid cheap. Most logical people simply want long lasting. Most of us would logically take up the longer lasting alternative. What is any logical person going to answer? They are immediately going to ask for a longer lasting crown. And it is at this moment then that the penny drops, when they do make the mental connection that improved longevity will come at an extra cost. Because in dentistry, workmanship and skill do come in as inherent factors that affect the price that we charge. We’re not talking the difference in price between retailer A and retailer B for the same 500g large jar of Vegemite. Callers to our office want solutions to their problems. These callers have done their research on us and have chosen us to be their dentist before they make the call. They have the information about us. All we need to do in answering the call is to help confirm that decision in the caller’s mind. The reason the caller asks the price question is that they do not know what else to ask. So they lead with price. Our answer should always be about solving their problem, and we do this by asking some simple qualifying questions back. Leading with an answer that is a number rarely secures an appointment. Tracking the results of inbound phone enquiries, and whether or not an appointment is secured, and kept, will give valuable insight into the efficacy of what is said by your staff on the phone. My comments above are not some dreamt up in some coffee shop. These are measured results gained from years of running a successful multi-million dollar dental office of my own. These results have been duplicated by my clients who are dedicated to improved results. Will this work in your practice? The answer is in the mirror….